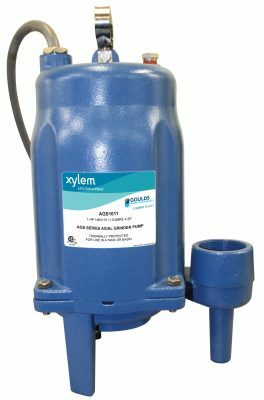 The AGS Series grinder pumps feature axial grinder and semi-open impeller technology to easily slice through the solids, flushables and trash found in the modern wastewater stream without roping or clogging. The powerful semi-open impeller and axial grinder reduce waste to a fine slurry to minimize downtime and service issues. 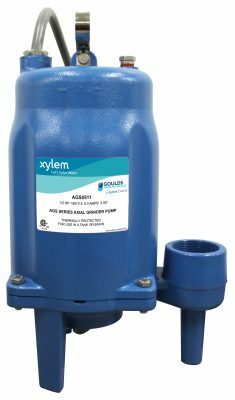 AGS Series pumps offer solutions for a range of residential and light commercial applications and are an ideal replacement for 2″ discharge sewage pumps. Head/Capacity: Models deliver up to 66’’ TDH and flow rates of 53 gpm capacity/flow. 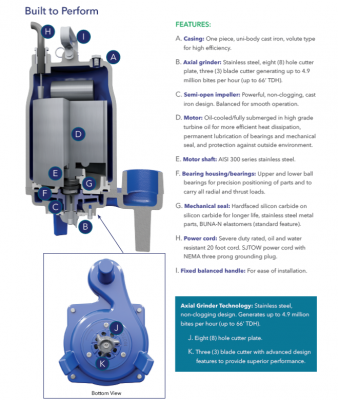 Semi-open impeller: Powerful, non-clogging, cast iron design. Balanced for smooth operation. Casing: One piece, uni-body cast iron, volute type for high efficiency. Motor: Oil-cooled/fully submerged in high grade turbine oil for more efficient heat dissipation, permanent lubrication of bearings and mechanical seal, and protection against outside environment. 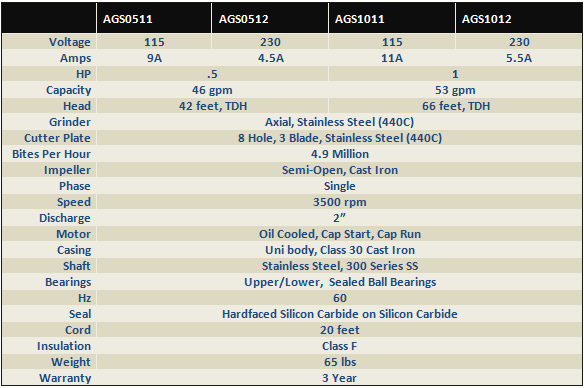 Motor shaft: AISI 300 series stainless steel. Bearing Housing/Bearings: Upper and lower sealed ball bearings for precision positioning of parts and to carry all radial and thrust loads. Mechanical seal: Hardfaced silicon carbide on silicon carbide for longer life, stainless steel metal parts, BUNA-N elastomers (standard feature). Power cord: Severe duty rated, oil and water resistant 20 foot cord. SJTOW power cord with NEMA three prong grounding plug. Designed for continuous operation: Single phase, built-in, auto reset overload (Class F insulation) on all models. 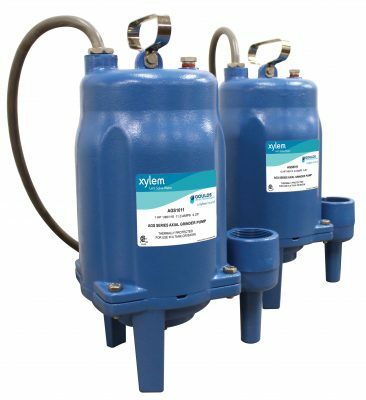 Ease of installation – Fixed balanced attachment to help simplify installation.